Our neighbor has the tree. I have the butter, brown sugar cinnamon, oats and the ice cream. We had a party. 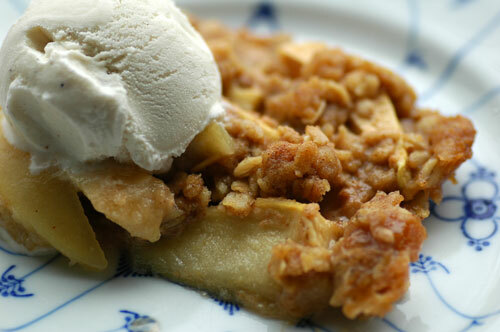 There are thousands of versions of apple crisp; it’s difficult to go wrong–unless you use the wrong apples. Honey Crisp are best, followed by Granny Smith. I used some other tree apples that weren’t as juicy as I’d hoped, so I just added some white wine to baking dish and it turned out just fine. The best practice for the topping that I’ve used many times is to melt the butter and then add the brown sugar, oats, flour and salt. Mix that all up really well and then cover the apples with it. Make sure you have ice cream before you begin. No, really… go make sure you have ice cream for this before you start this. In a large bowl, combine the apples, granulated sugar, cinnamon, and 1/8 teaspoon of the salt and toss to coat. Place the apple mixture in the prepared baking dish and set aside. Using the same bowl as for mixing the apples, mix together the brown sugar, oats, flour, and remaining 1/8 teaspoon salt until evenly combined. With your fingertips, blend in the butter pieces until small clumps form and the butter is well incorporated, about 2 minutes. Or if you prefer, you can melt the butter on the stovetop and then thoroughly mix into the brown sugar, oats, flour and salt.